Have you heard of floating aquarium plants, but you’re unsure of what they’re about, which ones to choose and what care they would need? Then you’ve come to the right place, because here you will find out all about them! Free-floating plants aren’t attached to the bottom of your aquarium, they float just above or beneath the water’s surface. The roots usually hang in the water, looking for nutrients and therefore don’t have a set emplacement within your aquarium. Floating plants are great for beginner aquarists as they require minimal care while helping you keep a balanced ecosystem in your planted aquarium. There are many varieties of free-floating plants available, each with their own requirements, needs, and benefits. In this article, I’ve gathered all the information I feel you ought to know before adding any such plants to your tank. I cover all the benefits floating aquatic plants can bring to a planted tank, how to choose the right ones to fit in with your existing aquarium inhabitants, and then take a detailed look at what I consider to be 10 of the best floating aquarium plants that exist. Benefits of Floating Plants in Your Aquarium? Do You Really Want Floating Plants? Or Would Rooted Be Better? Floating plants don’t only look great, they’re also very beneficial to keep your tank’s inhabitants happy and healthy. Let’s quickly go over the benefits of having them in your aquarium, for you and your fish. Floating plants are a great way to bring nature close to you and give your aquarium a more natural look. Because floating plants aren’t attached to the bottom of your tank, they move freely around the water surface and give your aquarium a unique presence and a different setup every time you look at it. Also, with so many varieties of floating plants to choose from, it gives a wonderful opportunity for you to ‘put your own stamp’ on your tank, make it stand out from the crowd and be somewhat unique and to your own tastes. Some of us aquarium hobbyists and plant lovers have limited skills or time we can put into maintaining our tanks. Luckily, many floating plants are low-maintenance, easy to grow and care for, will require very little time or effort from you, with your main task simply consisting of the occasional trimming and pruning. Floating on the water’s surface, they provide shade to low-light water plants located closer to the bottom of your aquarium, helping them attain an optimal growth rate and controlling algae growth as well. Floating plants also provide shade and hiding places for fish that would rather avoid direct light, such as bettas, dwarf puffers, or gourami species. Many fish species enjoy floating plants as a snack or even a full meal. Floating plants often contain high levels of nutrients, such as protein, amino acids, and even sugars. If you have herbivorous fish – goldfish or cichlids – make sure to choose one with a fast growth rate – such as duckweed – or you’ll soon find your aquarium plantless. Although nitrates can be controlled by replacing the water, floating plants will give you a helping hand by feeding on nitrate and keeping the levels in check. Floating plants also help to oxygenate the water and act as a water filter, removing excess nutrients as well as waste from fish. Floating plants provide your fish and invertebrates with hiding space and defense against potential predators and bigger fish. They also make a perfect habitat for fish to lay their eggs and for fry to shelter until they mature. Waste and decaying plants are usually the main cause of algae growth, with all the nutruents in the water fuelling their growth. By having plants in your aquarium that gobble up nitrate and phosphate nutrients, it means there’s far less for algae to feed on. Basically the plants will outcompete algae for resources and hence keep algae growth down. All this sounds exciting but there are so many floating plants out there, with different lighting, temperature and water parameter requirements, that means not all of them are suitable to be in the same tank as certain fish species, or indeed some other plants. So how do you choose the perfect match for your aquarium? Let’s take a look. Floating or rooted plants? How do they differ? Both floating and rooted plants share some benefits as they will oxygenate and filter your tank’s water, while removing excess nutrients and pollution. Beside these shared benefits, both floating and rooted plants also have their own unique benefits…as well as some disadvantages. Some fish and plants won’t survive under direct sunlight. Because they’re floating above the water surface, floating plants give a very unique jungle-like appearance to your aquarium, providing more shade than rooted varieties would at the bottom of your planted tank. Floating plants also feed exclusively from nutrients found in the water – whereas rooted ones get most from the sand or soil they’re in – so are therefore better suited to prevent algae growth. Floating plants also tend to grow faster than rooted plants. Depending on the amount of time you have to dedicate to their care, this is something you might want to take into consideration. Because of their fast growth, they should be closely monitored. If left alone, they can expand beyond control. They might take over the entire surface of your aquarium, leaving your fish and other plants depleted of oxygen and light. Oxygen mostly enters your tanks water at the surface, but a thick carpet of plants can prevent this. So you must allow at least some clear, plat free space on the surface. They might also get sucked up into and lost in your water filter, especially the smallest specie like duckweed. Because they’re free-floating plants and don’t have a set position in your fish tank, they tend to be more challenging to play with when it comes to aquascaping. Rooted plants require more initial tank preparation, as the roots need to be buried in the substrate. Because they feed – at least partially – from the roots, the substrate must be nutrient-rich. Rooted plants, however, allow you to choose a specific spot within your tank and provide a natural habitat for your fish, creating the exact aquarium landscaping you’re looking for. Lower plants can also serve as protection for shy fish. Many planted species have slower growth and will, therefore, require less maintenance and care than fast-growing floating plants. Before purchasing any plant, consider how much space you have for it to expand and grow into, as not all will be suitable for small aquariums. The species you choose should leave plenty of space for light to penetrate all the way to the bottom of your aquarium. As an example, one water hyacinth’s leaf could cover half of a small tank’s surface! When owning an aquarium, it’s important to think ahead. Don’t only choose your plants based on the fish and other water plants living in your aquarium today, but also on what you might want to add to your tank later. Fish and aquatic plants have their own preferences and requirements when it comes to water temperature, hardness, lighting and water acidity. Choosing a plant requiring warm temperature will prevent you from adding coldwater fish in the future. To allow your life at the bottom of your aquarium to survive and thrive, be equally mindful of what lives under the plant’s leaves. Floating plants love the direct sun but so do some rooted varieties, as well as fish. Keep in mind that some fish – herbivorous species, in particular – devour water plants, and won’t leave much of it for you to enjoy. Add goldfish to your aquarium and your duckweed will be eaten up in no time! Too often, we get excited and start landscaping our aquariums and adding too many plants – or the wrong ones. Before you know it, the lack of light threatens your tank’s ecosystem, leaves start turning yellow, and fish are giving you a sad face. A balance needs to be maintained, as high-intensity lighting will encourage algae growth. On the contrary, some plants require and look for shade and indirect light. In this case, floating plants might be a perfect fit. Plants help you shape the look of your aquarium whichever way you desire. Do you like flowers? Are you looking for a green soft carpet water surface? What about plants that emerge from the top of the tank and grow out of the water? With floating plants, the possibilities are endless. Depending on their growth rate, some plants require more or less love and care to keep them under control. It’s important to determine how much time you have to dedicate to your aquarium beforehand, and to choose only the species you’ll be able to handle and properly care for. If you do not want to be too ‘hands on’ with pruning and trimming, make sure you get slow growing plants only. But if you don’t mind inspecting and tidying things up in your tank every couple or few days, then you can also consider fast growing varieties. Now that you know what to look for and what to avoid for when choosing your next floating aquarium plant, let’s get into some recommendations! Below I’ve detailed and discuss 10 of the best floating aquarium plants available. We look at their lighting requirements, water requirements, growth rate, how much time and effort is required to care for them, and also compatibility with other plants and fish. Color Form: Bright green leaves with white flowers and small green berries. In the wild, water lettuce can grow up to 10 inches high and four inches wide, but might be of a smaller size in aquariums. Its bright green leaves don’t have stems, and spread horizontally over the water surface in a rosette-like shape. The feathery leaves are covered with short, soft hair. Water lettuce can also produce dioecious white flowers – often hidden within the plant’s leaves – and small green berries can be spotted after successful pollination. Also called water cabbage or Nile cabbage, this plant is from Africa, near Lake Victoria. Today, water lettuce is considered an invasive species – threatening native vegetation and fish. Because water lettuce is illegal in several states, it’s best to check with your local authorities before adding it to your aquarium. Water lettuce usually grows in wetlands but can be found in any body of water. It prefers warmer climates, with water temperatures ranging from 70 to 80 degrees Fahrenheit. Even brief exposure to frost will damage the leaves. Water lettuce is compatible with most fish and water plants. Large herbivorous fish, such as goldfish, might not make the best tank mates, as they’ll make a feast out of the plant’s roots and leaves. Water lettuce prefers shaded areas but will grow faster if exposed to bright light. Regular full spectrum T5 or T8 light bulbs can gradually be introduced for faster growth. The plant’s growth can be misleading as it starts out fairly slowly. However, through asexual reproduction it will then spread at a fast pace, forming a dense mat over the water’s surface. Baby plants will be found floating beside their mother plant, connected by a short stolon. As a fast-grower, water lettuce can quickly overrun an aquarium, depleting life underneath of oxygen and light, potentially causing a nuisance. It might be a good idea to remove a few plants on a weekly basis. Because water lettuce grows best in a humid environment, if you’re looking for optimum growth, a covered aquarium is recommended. Water lettuce can be difficult to grow in a home aquarium. However, with the right care, these plants can be a great addition to your fish tank by forming a beautiful labyrinth of hanging roots – making an ideal home for fry and fish. Water lettuce is ideal for all aquarists having small fish preferring warmer water temperatures. It’s an easy plant to care for and can prevent algal bloom by filtering excess nutrients from the water. You might want to choose another species if you have or are planning to add cold water fish or large herbivorous fish to your planted tank. It’s also difficult to grow this plant if you have a hang-on-back filter, as the leaves will be pushed around and sometimes even submerged by the current. Color Form: Light green, tiny white flowers can sometimes be spotted. Growth rate: Aggressive – low maintenance but needs to be scooped out on a weekly basis. With two air pockets allowing the plant to float just above the water surface, duckweed is tiny with oval-shaped leaves. On rare occasions, small flowers can grow, producing fruits and seeds. The roots – which can range from less than one inch to about 5.5 inches deep – help the plant stabilize and get the needed nutrients from the water. Duckweed received its name from local farmers who used this popular plant to feed ducks and several fish species. As of today, 40 species of duckweed have been discovered and can be spotted everywhere you’ll find stagnant water. Duckweed is a freshwater plant but can also survive in waters containing a very low concentration of salt – up to 2.5 percent salinity. Although duckweed can survive in temperatures between 42.8 and 91.4 degrees Fahrenheit, it grows best between the 68 and 86 degrees Fahrenheit, with a water acidity ranging from pH 6.5 to 7.5. In a pond, if the water becomes too cold, it will sink to the bottom, and wait for the temperature to increase, returning to the surface when the warmth returns. Duckweed gets along well with other plants and fish, and even though herbivorous fish – such as cichlids – will devour your duckweed, it will probably grow faster than it can be eaten. Duckweed tolerates low light but will grow faster under direct sunlight. Hanging fluorescent lights 12 to 20 inches above the tank should suffice if you don’t have a suitable window location. As one of the fastest growing water plants, duckweed is very easy to care for. Therefore it’s ideal for beginners. Under the right conditions, duckweed can however double its size in 16 hours. If it grows faster than you’re expecting, simply scoop some out – you can even freeze some of it, for up to three months if needed. Because it’s fast growing, it requires a large number of nutrients. Adding fertilizers will ensure optimum growth. Duckweed makes a healthy food source for large herbivorous fish, who will be an extra help keeping the plant’s expansion under control. If you’re looking for a fast-growing water plant – though you’ll still have to keep an eye on its expansion – duckweed might be what you need. As it’s easy to maintain, it makes an ideal species for beginner aquarists. If you have a limited amount of time to dedicate to your aquarium or are away from home for extended periods of time, it may be best to choose a slower-growing plant. Color Form: Dark green leaves with minuscule flowers composed of about eight green-brown colored petals. Hornwort is a very graceful aquatic plant with dark green feather-like leaves helping oxygenate and clearing the water. In warmer waters, the leaves can become lighter in color. The leaves – growing in whorls of six to twelve – can grow from 0.5 to 1.5 inches long, and the stems can reach 24 inches in length. This is a free-floating water plant which can be also be rooted in case you change your mind! Hornwort can grow small brown flowers – no longer than a tenth of an inch long – producing nut-shaped fruits with three spines. As a monoecious plant, it contains both male and female flowers. Native to North America, hornwort is now found worldwide – except in Antarctica. Over 300 different hornwort species have been identified. However, 100 to 150 species seems to be a more realistic figure, as some may have been miscategorized. Hornwort can tolerate a wide range of water conditions, which makes it adaptable to most aquarium settings and a perfect plant for inexperienced aquarists. It can be found in both stagnant and moving waters and can even be attached to a substrate if desired. Although hornwort can survive in both cold and warm water – ranging from 59 to 86 degrees Fahrenheit – it will grow best in warmer water temperatures. Hornwort is a good tank mate for most fish, especially live-bearers, guppies, or common mollies, as they’ll hide in the leaves when mating. Gouramis or angelfish, however, use hornwort as a food source and should be avoided. Hornwort only requires moderate lighting, but high-intensity light will increase photosynthesis and growth. Make sure to replace your tank water regularly to clear the water and allow light to penetrate all the way through your planted tank. The more light, the greener the plant will be! Also known as coontail, hornwort is one of the easiest freshwater plant types to grow in an aquarium environment. Hornwort is known to be a fast-growing plant, with as much as five inches of growth per week reported. To support its growth, it will need nutrient-rich waters, CO2 fertilization along with high-quality aquarium fertilizer can be beneficial to the plant’s expansion. Warmer temperatures will encourage hornwort’s proliferation, but be mindful of the needs of your other aquarium inhabitants before adjusting the water temperature. If the stems expand further than needed, trim to the desired length and remove the cuttings from the tank. If you’re looking to introduce an aesthetically pleasing plant to your aquarium and are prepared for regular pruning, hornwort can make a great addition to your tank. Hornwort requires a minimum tank size of 15 gallons, as it could quickly get out of control in smaller fish tanks. Hornwort also makes a great nursery, where baby fish can hide and find protection. Maintaining the growth of hornwort needs dedication and attention. If left unattended, it will dominate and prevent light and oxygen from reaching the bottom of the aquarium, which could kill your water plants and fish population. If this level of maintenance isn’t something you can provide, a slower-growing plant might be better suited. Color Form: Green with small but beautiful white flowers. As a young plant, Amazon frogbit can be identified by its flat leaves floating on the water surface. Once it matures, the leaves will grow above the water surface producing small white flowers. Amazon frogbit is often used as an ornamental plant and can grow as tall as 20 inches. Female flowers will produce a tiny fruit, measuring anywhere from 0.16 to 0.6 inches long. Native to Central and South America, Amazon frogbit has made its way to the United States through aquascaping and can now be found throughout California. Amazon frogbit can survive through water temperatures ranging from 64 to 84 degrees Fahrenheit, with a pH between 6.0 and 7.5. For optimal growth, it might be best to add a highly nutritive fertilizer on a weekly basis. It should only be added to tanks with minimal water movement, as any current will pull the leaves under water, slowing down its growth. If your aquarium’s ecosystem includes snails, it might be best to place Amazon frogbit toward the center of the tank. Snails love feeding on the underside of the plant, damaging the leaves. If you’re really set on adding a colony of snails, Malaysian trumpet snails are plant-friendly and would make better tank mates. Amazon frogbit prefers medium light intensity and full spectrum T5 or T8 light bulbs or even LED lights should be more than enough to help it thrive. Amazon frogbit is a fast-growing plant, reaching 20 inches high at maturity and spreading over your entire aquarium surface if allowed. Doing this will prevent light and oxygen from entering the water, and your ecosystem will suffer. Although reproduction can take place sexually through the seeds, in an aquarium, stem fragmentation is most likely to happen. Plantlets break off the parent, forming new plants. Amazon frogbit care is simple. Ensure that the top of the emerging leaves stay dry at all times by avoiding splashes during a water change. The leaves will begin to rot if water is left sitting on the surface for an extended period of time. If you’re aquascaping your tank and in need of a multi-functional floating plant providing both an elegant look – with rounded bright green leaves and beautiful white flowers – and the convenience of creating shade, this might be the species for you. As Amazon frogbit will eventually cover the entire surface of your tank in a matter of weeks, you’ll be required to prune the leaves and stems regularly. If this level of care doesn’t match your lifestyle, it might be better to choose a slow-growing water plant. If you have a large snail population, they might destroy your Amazon frogbit, in which case another species would be better suited. 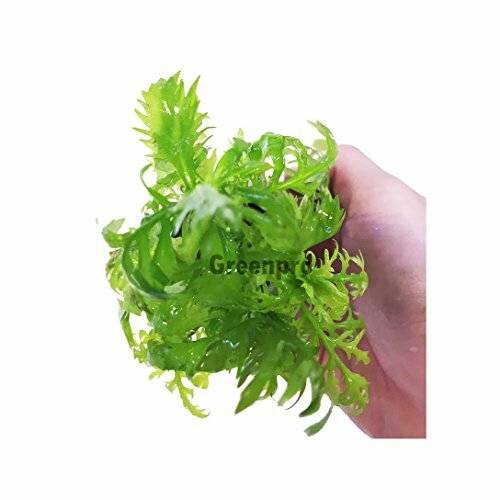 Color Form: Bright green leaves, which become brighter as the water temperature increases. Water wisteria is one of the most beautiful floating aquatic plants and is sometimes mixed up with water sprite. The two are equally impressive but are however two entirely different species. Water wisteria’s appearance changes depending on its environment, water conditions, and lighting. In cold water, it will be smaller and lobed, instead of growing leaves on each side of the stem. The leaves are of vibrant green color and if planted, can reach the water surface. The sturdy stems are slightly darker and can grow 20 inches high and 10 inches wide. Water wisteria is native to the Indian subcontinent, including Nepal, Bangladesh, Bhutan, and India. It’s now found globally. Water wisteria can withstand a wide range of water conditions. However, in order to thrive, it should be kept between 74 and 82 degrees Fahrenheit with a pH ranging from 6.5 to 7.5. Carbon dioxide fertilization can be added to the water if needed. This species can be kept in aquariums as small as 10 gallons and prefers soft to moderately hard water – a KH of three to eight. Water wisteria’s more recommended tank mates consist of small fish, shrimps, and plant-free species, such as bettas, danios, cherry barbs, corydoras catfish, and tetras. Rainbow fish, goldfish, silver dollars, and cichlids would uproot your plant and eat the leaves leaving only a few lonely stems for you to enjoy. Because water wisteria creates an immeasurable number of hiding spots, it makes a great addition to breeding tanks where fry can find protection. Water wisteria can be kept with most other water plants as long as your tank isn’t too crowded and it doesn’t have to compete for nutrients. Moderate lighting is required for water wisteria to thrive, however, high-intensity light will promote the plant’s growth and help maintain its beautiful bright green color. If you don’t have access to direct sunlight or a window, two to three watts per gallon of full spectrum (5000-7000K) light should be enough. Water wisteria care is easy and doesn’t require much maintenance, which makes it an excellent species for new aquarists. It’s one of the fastest growing plants in the underwater world. To sustain its year-round growth, water wisteria needs a nutrient-rich substrate, iron, and trace elements. CO2 fertilizer can also be added to the water. While its fast growth will make your life easier, it also needs to be contained and trimmed to keep it under control. Cuttings should be removed from the water immediately, or they’ll fall in the substrate, creating new plantlets. If you’re looking to propagate your water wisteria, make sure the cutting has a few leaves and plant it in the substrate. If you’re looking for a mid-ground or background plant to shape your aquarium, water wisteria would be a perfect candidate. As one of the hardiest species, it also makes a great species for beginners. Although water wisteria would suit most hobbyists and aquariums, if your planted aquarium is mainly composed of herbivorous fish, you might want to think of adding other – maybe less appealing – floating aquatic plants to your tank. Color Form: Light green color with delicate leaves. It doesn’t produce flowers. 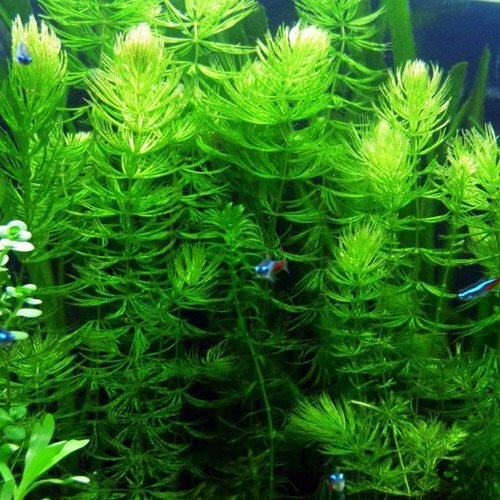 With its delicate and graceful leaves, Java moss makes a beautiful addition to any aquarium. Although each plant might have a completely different appearance, it will give your tank a vibrant bright green look. Java moss doesn’t have real roots. Instead, it feeds exclusively from its minuscule oval-shaped leaves branching out from the stems. Java moss isn’t only native to Java, but also Southeast Asia, Indonesia, Japan, Malaysia, Philippines, Singapore. This plant is now one of the most common mosses used in aquariums all over the world. Java moss prefers warmer water temperatures, from 72 to 82 degrees Fahrenheit with an acidity level ranging from 6.0 to 7.5. Because Java moss leaves are very dense, debris gets stuck on them very easily. It’s best to place it where there is good water flow. As Java moss grows as a clump, it’s a great choice for tanks with fish and fry needing hiding places or building bubble nests, such as bettas and gouramis. It, therefore, makes the ideal plant for breeding tanks, and invertebrates such as shrimps. Java moss doesn’t require a great amount of light to thrive, however, its growth would be faster with higher light intensity. Lighting should be closely monitored as otherwise, with more light, the chances of algae developing and colonizing your Java moss increases. When algae finds its way through java moss, it will be practically impossible to remove it and the plant will have to be discarded. Java moss is slow-growing and maintaining cool and nutrient-rich water will be the key to its well-being. Warm water and potential liquid fertilizer would help it grow to its full capacity. As your java moss grows, prune it to the desired shape. The cuttings can be used to form new plants. Because of potential debris accumulating within the leaves, it’s recommended to clean the moss to maintain the plant’s bright green color. Remove the moss from your aquarium and rinse it well under water. This is a sturdy plant, so don’t worry about damaging it. Java moss is one of the easiest plants to grow and is excellent for any aquarist owning low-light tanks. If you’re into aquascaping, Java moss will offer you many opportunities. Because it can be free-floating or attach itself to any surface, it can be placed anywhere in your aquarium without having the risk of overgrowth. If your tank contains fry or shrimps, Java moss will be a great source of natural food and places to hide. If you have other water plants requiring high-intensity lighting, or if you’re looking for a fast growing floating plant, other species might be more suited. Color Form: Light green to brown depending on the plant’s maturity. Each leaf is covered with whitish hairs. 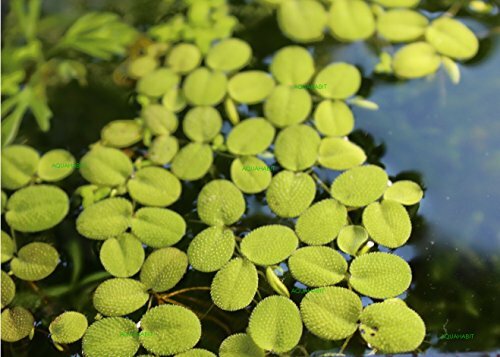 Water spangles is a rootless floating aquatic fern, with small oval-shaped leaves ranging from 0.16 inches to 0.8 inches and forming floating mats on the water surface. Each node contains three leaves covered with fine white hair to repel water. Two of the leaves are emerged and float over the water surface. One additional leaf dissociates itself, sinking under the water surface, acting as root. Leaves usually start out green and often turn brown as they age and are exposed to the sun. Water spangles are native to South America, the West Indies, and Mesoamerica. It was first introduced to the United States in the 1880s as an agricultural plant grown in greenhouses and gardens. In the 1920s, natural flooding allowed it to spread to Florida. Ten species of salvinia exist, and it’s today classified globally as an invasive species, harming native habitats. Water spangles’ growth and destruction have spread throughout Texas and Louisiana. Water spangles is mostly found on the surface of slow-moving and stagnant freshwaters, but can also bear a salinity of four to seven parts per thousand. Water spangles highly benefit from nutrient-rich waters and prefer a water temperature ranging from 64 to 90 degrees Fahrenheit. When it comes to water acidity, they are relatively tolerant – withstanding a pH of 5.0 to 8.0. Any fish looking for shade will enjoy the presence of water spangles. Because it can also live in low saline waters, brackish fish would make perfect tank mates. When it comes to lighting, water spangles are self-sufficient and only require a moderate amount of lighting or indirect sunlight. Water spangles goes through three interesting stages of growth. It starts as a single bud, the leaves floating flat over the water surface. The leaves will soon multiply and expand, curving upward. Once the plant matures, it becomes a dense mat floating on the water. Water spangles are one of the fastest growing plant types, showing exponential growth. In Texas, record growth has been reported with a population doubling every two weeks. It’s thought to be a sterile plant only reproducing asexually through fragmentation. Stems can grow up to four inches before naturally breaking off, forming a new plantlet – potentially remaining dormant if growth conditions aren’t favorable. If you’re a hands-on type of person ready to keep a close eye on your plant’s growth, then water spangles would be a great addition. If you love aquariums but prefer enjoying its peaceful presence over actively taking care of it, a slow-growing plant might be best suited. If not regularly pruned, your planted aquarium will soon be covered with a dense mat, preventing oxygen and light from passing through. Color Form: Green leaves with bright yellow flowers. The underwater leaves become darker as they catch and digest preys. This very interesting carnivorous plant can form large mats on boggy waters. The plant itself is about half an inch long and a sixteenth of an inch thick and doesn’t show any roots. Its delicate underwater leaves become a darker color when trapping and digesting small organisms. Within a half hour of digestion, the trap will be ready for new prey. At the end of a single and vertical standing six-inch stem, floating bladderwort produces a few beautiful bright yellow flowers from spring to mid-summer. The flowers are symmetrical (two-lipped) with two stamens and a superior ovary. It also produces seeds. Bladderwort is a large genus composed of over 200 species. It’s present in every state, except Alaska and the Rocky Mountains. It’s also found in Canada, Central and South America, Africa, most of Asia, Israel, New Zealand, and Spain. Bladderwort is usually found at lower altitudes but can be seen as high as 8200 feet above sea level. Bladderwort is usually found in quiet and acidic waters rich in tannins, containing very little phosphorus and nitrogen. It requires a large amount of oxygen to survive, and stagnant waters – such as in an aquarium – rarely contain any significant amount of oxygen. Bladderwort is, therefore, best placed near your water filter or where there is current. In order to survive, the water needs to be rich in microorganisms for the plant to feed on. Bladderwort can survive in moderately hard water, but the water needs to be on the acidic side. To keep the water acidic, a handful of peat moss per gallon of water can be added to your tank. The plant can adapt to a variety of water temperatures ranging from 40 to 90 degrees Fahrenheit. Carnivorous plants such as bladderwort typically feed on microorganisms and zooplankton; however, they can also make a meal out of newly hatched fry. You wouldn’t have to worry about anything bigger than that. Bladderwort enjoys growing under or surrounded by emergent plants, such as amazon frogbit or water lilies. Although herbivorous snails and fish can eat it, the greatest threat is often filamentous algae. Floating bladderwort needs high-intensity lightning. A fluorescent tube of 6000 lumens can be used to provide sufficient light for optimal growth. Bladderwort is easy to grow and makes a great beginner water plant. It will thrive best in large fish tanks of 30 gallons or more. One to three inches of peat moss can be added to the water as it releases tannins. This supports the plant’s growth, maintains the water acidity levels, and reduces algae expansion. Because bladderwort doesn’t have the ability to store sugars, it uses it all for its growth, which explains its fast growth and large amount of oxygen needed. The oxygen produced from photosynthesis isn’t sufficient, and it relies on the oxygen present in the water. Catching abundant prey is a critical factor to maintain the plant’s health. Floating bladderworts can be propagated from cuttings, which should be at least three nodes long. If you’re looking to bring a new level of uniqueness to your planted aquarium, this might be the right choice. This species is best for aquariums with low-nutrient waters or with other water plants requiring a high level of nutrients. If placed in breeding tanks, the fry would provide bladderwort with the needed nutrients. Floating bladderworts have different environmental needs than most water plants. If you cannot provide the microorganisms, small insects or fry to feed it, it’s unlikely to survive. Color Form: Green or reddish depending on the amount of sunlight. Azolla leaves are usually one or two inches wide and very abundant. Each leaf contains one floating upper lobe and one underwater lower lobe, containing a small fruit. They form large mats on the water surface with roots hanging down in the water. Sometimes Azolla can appear a reddish-brown color. Depending on the species, plant diameter will range from 0.4 to one inch for smaller species and can reach six inches for more mature plants. Azolla has a long history dating back 1500 years ago, with reports of Azolla being used as a biofertilizer by rice farmers. In the 17th century, Azolla was utilized as a green compost and in the 18th century, was fed to poultry in Peru. Interest in the plant declined after the 1980s, and today Azolla is often considered as an invading weed. Azolla’s well-being heavily depends on the amount of phosphorus mineral content present in the water and therefore needs a nutrient-rich environment. In an aquarium set-up, algae bloom provides added nutrients, including phosphorus. Azolla prefers still or slow-moving waters with temperatures ranging from 59 to 80.6 degrees Fahrenheit and won’t survive temperatures below 41 degrees Fahrenheit or above 113 degrees Fahrenheit. It can tolerate a wide range of water acidity levels – from pH 3.5 to 10 – but optimum growth is achieved between pH 6.3 and 8.0. Azolla is a freshwater plant able to live in low salinity waters. Azolla forms a symbiotic relationship with Anabaena colonies, which can transform atmospheric nitrogen into nitrate fertilizer. It offers Anabaena protection and nutrients, in exchange for nitrogen and other essential nutrients. Because of its high content in protein, vitamins, and essential amino acids, Azolla makes a healthy food source for all herbivorous fish. Azolla grows best in full or partial shade (up to 50 percent of direct sunlight). With less than 1500 lux, its growth will be significantly impacted, and with more than 50 percent, the plant reduces photosynthesis. In case your Azolla receives too much light, it protects its photosynthetic mechanism by absorbing some of the light and transforming it into heat; giving the plant that potential red color. Azolla’s growth heavily depends on the amount of phosphorus present in the water and phosphorus fertilizer can be added to your aquarium on a weekly basis. Growth decreases as water salinity increases. Growth comes to a full stop at 33 percent of seawater content and would result in the plant’s death beyond this threshold. A humid environment showing optimum growth between 85 and 90 percent humidity is ideal for your Azolla. If the humidity drops below 60 percent, the plant would dry and become fragile. Azolla reproduces sexually and asexually by growing runners with young plants at the end. As these plantlets mature, they detach themselves from the parent to create a brand new plant. This allows the pant to double its biomass every two to three days, which requires regular pruning to avoid overgrowth. This fern is a great addition to reduce the nitrate levels in your aquarium and provides a food source for your fish population. Because very little care is required, it’s a great plant for beginners. It can also be suitable if you’re trying to establish a brackish habitat with low salinity waters and fish. Because of its potential fast growth, azolla needs to be trimmed regularly and contained, requiring time and attention. If you do not wish to invest the time and attention, this isn’t the plant for you. Color Form: Dark green leaves. Purple flowers with a ‘yellow eye’ located on one of the petals. Water hyacinth is characterized by its large leathery foliage and delicate purple flowers, featuring a yellow eye. The dark green leaves can vary from an oval to an egg-shape, are arranged in a rosette shape, and are filled with air pockets, allowing the plant to float. Water hyacinth grows beautiful lavender-purple flowers with six petals. Each flower grows at the edge of the six-inch stem and usually only last one day but bloom throughout the season. The plant usually grows four to eight inches tall, potentially reaching 40 inches height for more mature specimens established in dense mats. When water hyacinth isn’t blooming, it can easily be mistaken for Amazon frogbit. Water hyacinth grows very long and adventitious underwater roots, along with a fruit containing up to 300 tiny seeds. As the flower matures, the stalk gradually bends into the water, releasing the seeds. Water hyacinth is native to the Amazon basin and has spread throughout South America. In 1887, it was introduced into Louisiana by a group of Japanese visitors and is today considered as an invasive species outside of its native habitat, spreading in more than 50 countries on five continents. Water hyacinth is a freshwater plant and won’t survive in waters with more than 15 percent salinity. It prefers calm and warmer water temperatures ranging from 70 to 80 degrees Fahrenheit, with a pH between 6.5 and 7.5. Below 55 degrees or over 95 degrees, growth will be impacted. Water hyacinth gets along with all marine life. However, because it tends to hold on to water nutrients and light, it might be best to control its growth and keep it growing away from below plants requiring high-intensity sunlight. Herbivorous fish will enjoy this plant’s roots and in large numbers, might not be the most compatible tank mates. Because water hyacinth grows in tropical climates, it requires high-intensity sunlight to thrive and produce flowers. Water hyacinth is a perennial plant and one of the fastest growing water plants. It can double its mass within six to fifteen days, to form dense mats at the surface. The growth will slow down when temperatures drop below 55 degrees Fahrenheit as well as with insufficient nutrients, fast-moving waters, and high salinity. It can reproduce both sexually through seeds – which can remain alive for over 28 years – and asexually, by cloning itself into daughter plantlets. In an ideal environment, a single plant can produce 3000 other plants within 50 days. Water hyacinth growth heavily depends on the nutrients found in the water, and trace minerals can be added on a regular basis. To avoid this plant taking over your tank, monitor its growth and prune the stems regularly to keep it under control. If you’re looking to add a splash of color to your aquarium and are willing to take the time required for its maintenance, this plant might be a great addition to your aquarium ecosystem. Because this it’s fast-growing and quite large in size, you’ll need some water volume to grow the plant safely. If you own a small aquarium or won’t be able to keep up with the maintenance required to avoid overgrowth, a slower-growing species might be preferable. Free-floating plants represent an invaluable addition to any aquarium. With so many species available for you to choose, it’s easy to get lost. However, I hope this article, along with my selection of the best floating aquarium plants, will help you in your quest to select the perfect plant for your aquarium. Did you add floating plants to your aquarium? Which did you choose? We’d love to hear your feedback and if you have any questions on other plants not listed here, please leave us a comment below.